It’s important to understand that your experience doesn’t end solely with academia. Your best moments is going to be spent away from the lecture theatre at University and therefore it is vitally important to choose a place with a culture and lifestyle that suits your preferences. Do you enjoy the hustle and bustle of the city, or would you much rather prefer a quiet life along the seaside or country? Will you be working while you study? Are you going to take part in a club or society, or will you only focus on your current course? Choosing between living in a city or on campus will have a drastic impact on your enjoyment level while spending time at university. A university campus can be considered a self-contained town, with teaching, accommodation, and leisure facilities all offered in one destination. This can be perfect if you want an academic community, but others might find it claustrophobic and isolating. On the other hand, a city university might be better suited for those who want a life outside the institution instead of being surrounded by students all the time. Those who wish to work while studying will be better off with a city university as well. The distance you’ll be travelling is a crucial factor when it comes to choosing a university. In the United Kingdom, a student will travel 91 miles on average to attend a university, while this figure increases to 94 miles in the United States. The key benefits is making new friends and meeting new people, but not all of us have the same needs and wants. Another vitally important factor to consider is your expenses. While most students will go for a student loan along with part-time work to cover their studies, outgoing expenses can quickly accumulate without you even knowing it. 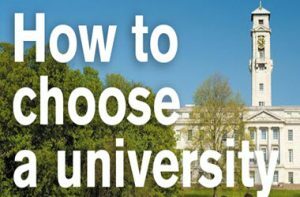 The cost of living from one university to the next will vary greatly so you will be required to take this into consideration as well when looking for the perfect university. For instance, in the United Kingdom, student accommodation is twice the cost of living in London when compared to Northern Ireland. University life is far more than just your degree. Most institutions are renowned for their comprehensive approach to additional activities, including societies and clubs, which means location is also a vital consideration. If you see yourself as a regular surfer, you’ll be better off choosing a coastal university as opposed to living in the city. If you are eager to do things outside the classroom, ensure you do some research on everything the university has on offer.